Violence is a public health issue. Living without the fear of violence is a fundamental requirement for health and wellbeing. This may seem like a statement of the obvious, but the public health response to violence in the UK is relatively untested. Here at PHE West Midlands, we’ve joined West Midlands Police and the West Midlands Police and Crime Commissioner to introduce the West Midlands Violence Prevention Alliance. We will work with organisations such as councils, hospitals and charities to help them provide services that prevent violence, using best practice and evidence of where violence takes place. One of our first actions will be to set up an injury surveillance unit that will collect, analyse and use data about violence in the West Midlands in order to prevent it from taking place and to reduce its severity. Looking back at other projects, in Cardiff, attendance for violence related injuries at A&E fell by 40% between 2002 and 2007 following the involvement of emergency departments in the local Crime and Disorder Reduction Partnership. The Cardiff model showed that by sharing anonymised data on the location of violence, weapon use, assailants and times of violence the local police could improve their targeting and reduce licensed premises violence and street violence in particular. PHE’s expertise in field epidemiology and in establishing real time syndromic surveillance systems makes us well placed to do this work. Nationally, our work to date on preventing domestic violence has seen a number of initiatives which provide training on how to support people affected and guide their colleagues, friends and communities on how to respond. Resources include a free toolkit for universities and a website for employers. Healthcare is one of the few places people suffering, or perpetrating abuse, turn to for help and we are working with Against Abuse and Violence to provide advice. 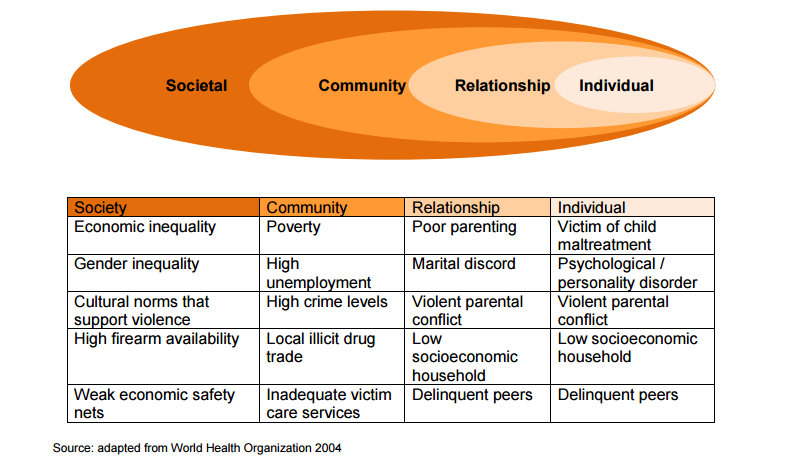 The World Health Organization approach towards violence prevention is set out by a typology of violence and an ecological framework which helps us to understand the contexts within which violence occurs. It also helps us to understand interactions between risk factors at the level of the individual, personal relationships, the community and a societal level. Using a public health approach we can then develop interventions to prevent violence from happening or reduce its impact. We are asking organisations that join the West Midlands Violence Prevention Alliance to sign up to the WHO’s violence prevention principles. West Midlands Directors of Public Health have agreed their own regional priorities and one of these is violence prevention. Analysis by PHE of admission rates to hospital for violence related injuries show a rate 10% higher than the English average across the West Midlands police area. And though recorded violent offences in the West Midlands Police force area fell from 163.7 offences per 10,000 population in 2008/09 to 112.2 per 10,000 in 2012/13, these are only the recorded offences. The British Crime Survey suggests that nationally only 43% of all violence against adults is reported to police. Violence is also closely related to inequalities. A national study for the Department of Heath found the poorest fifth of society suffering rates of hospital admissions for violence five times higher than the most affluent fifth. So where do we prioritise our resources and those of our partners? The local evidence tells us that young people aged 10 to 24 are by far the most likely to be victims of violence. An average of 17,703 violent offences against young people aged 10 to 24 years were recorded over the five years 2008/09 to 2012/13 by West Midlands Police - 42.6% of all recorded victims. 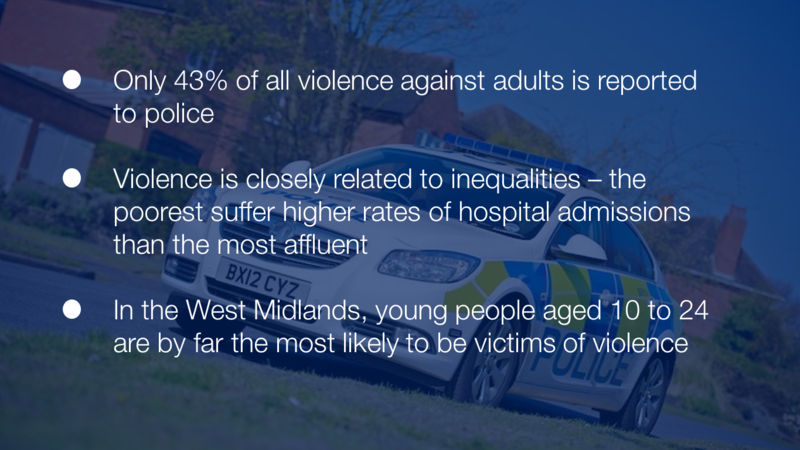 Violent offences against people aged 10 to 24 fell 37.7% between 2008/9 and 2012/13, but the rate remains unacceptably high and 35 young people were killed in the West Midlands in this period. Behind the figures lie blighted lives. If you experience violence your health, particularly your mental health and wellbeing, is more likely to be impaired than if you do not. Experiences of abuse and domestic violence are among so-called “adverse childhood experiences”. These increase the amount of stress people suffer in childhood, which in turn increases the risk for many different health problems in later life - from alcoholism to depression or heart disease to liver disease. Children who experience violence may live shorter lives than those who do not - with more ill health and less likelihood that they will reach their potential. Other groups are particularly vulnerable to violent injury. Domestic violence accounts for over a quarter of all violence reported to the West Midlands Police. Over a five-year period from 2005/6 to 2010/11 an average of 10,759 offences were reported each year. Of these 70% were categorised as ‘violence with injury’ and 30% as ‘violence without injury’ - suggesting psychological harm instead. A fifth of domestic violence is recorded to have involved alcohol. Sexual violence is known to be greatly under reported - perhaps only 1 in 10 adult victims of serious sexual assault report incidents nationally. 60% of the victims of sexual violence in West Midlands are children and young people up to the age of 24. And as in so much of public health, providing the best start in life and intervening with support when children and young people suffer from violence is fundamental. Agencies and communities do a lot already to prevent violence - but by working together we can do so much more to better understand which groups are experiencing violence, where and how; to spread good practice in prevention, and ensure that wherever people come into contact with services they get the support they need to prevent violence blighting their lives. In launching the alliance we are asking local organisations to gain a shared understanding of the picture of violence in their area and develop an action plan to address it. Each of us - public health, providers, police, community, council - are part of the picture. By joining our contributions in a coordinated way we will have a greater impact.